Acer announced that the new S7 ultrabook with Intel Haswell processors is now available online. Time to take a peek inside the Acer S7-392. 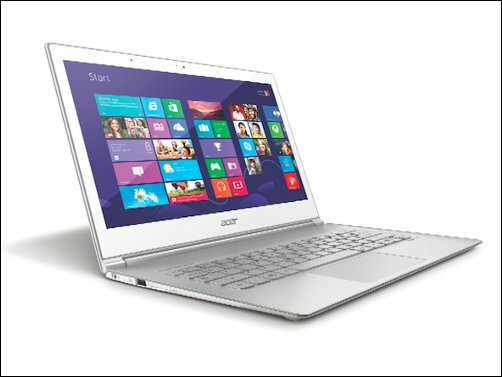 Acer decided to upgrade their previous S7-391 with Intel Haswell processors and have dubbed the improved model S7-392. The new S7 comes in two versions: The slightly less expensive one has an Intel Core i5 4200U CPU and a 128 GB SSD while the other offers an Intel Core i7 4500U processor together with a 256 GB SSD. Both have 8 GB of RAM as well as a 1,920 x 1,080 pixel IPS touchscreen. This 13.3-inch display is powered by an Intel HD Graphics 4400 chip. While we were hoping for 802.11ac WLAN, Acer decided to stick with 802.11n from the predecessor as well as Bluetooth 4.0. Overall, the S7-392 really isn't much different from the S7-391. To be exact, looking at it you won't notice a difference at all. It still measures 323 x 224 x 12.7 millimeters, weighs 1.3 kg and comes with 2 USB 3.0 ports as well as memory card reader, flash reader and HD webcam. The major difference can only be noticed after some time—8 hours, to be exact. That's how long you will be able to use your S7 ultrabook before the battery runs low, according to Acer. That comes of course courtesy of the new Intel Haswell processors. Whether or not improved battery life and twice the random access memory compared to the S7-391 justify the pricing, is something that only consumer habit will tell. The MSRPs for the two models are set at $1,450 and $1,700, respectively.